Notorious B.I.G. - Ready to Die (1994) BUY NOW! Notorious B.I.G. - Life After Death (1997) BUY NOW! Notorious B.I.G. 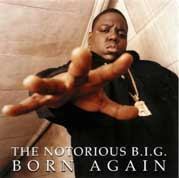 - Born Again (1999) BUY NOW! Notorious B.I.G. - Duets: The Final Chapter (2005) BUY NOW! Freestyle - Mister Cee Best of B.I.G. Live Freestyle 95 Best of B.I.G. Real Niggas Best of B.I.G. Big Poppa (J.D. Remix) Big Poppa 12"
Dead Wrong Dead Wrong 12"
Dead Wrong (Busta Rhymes Mix) Dead Wrong (White Label) 12"
Nasty Boy (Bad Boy Remix) Nasty Boy Promo 12"
One More Chance (Remix) One More Chance 12"
Spit Your Game (Remix) Spit Your Game (Remix) 12"
Warning (Clean Version) Warning 12"
Jr. MAFIA - Conspiracy Realms of Junior M.A.F.I.A. Lil' Kim - Notorious K.I.M. Notorious K.I.M.